Something I've been tackling within our home at the moment is Alexander's toy situation. With November being Alexander's birthday month, and Christmas following soon after, we're going to be having a influx of toys very soon, and it's good to try and prepare for that in advance, which is why this subject is very prevalent for me right now. Tackling the toy situation has always been important in our household - we live in a small two bed cottage, where space and storage are a luxury. During my close to three years of parenthood, I've learnt some things along the way that have really helped me to keep the mess of toys to a minimum, and today I thought I'd share them. 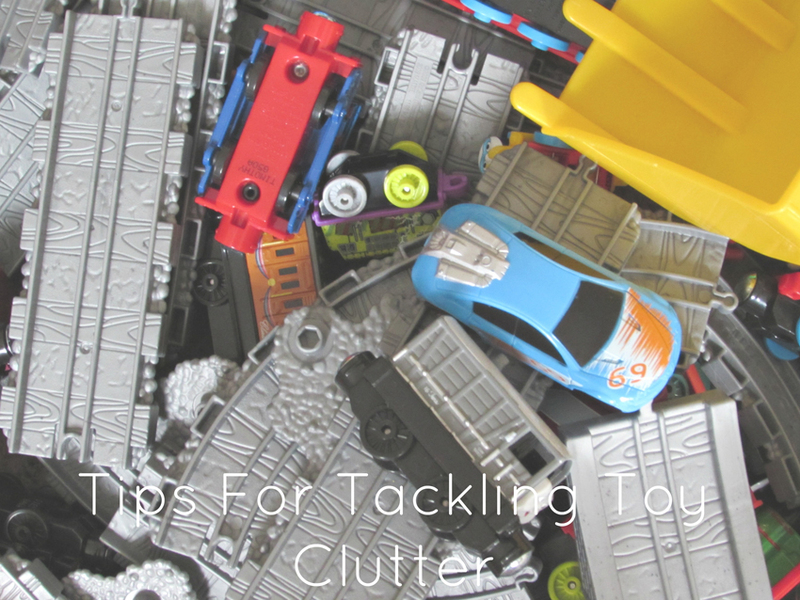 Although quite an obvious tip, I think some of us can avoid decluttering regularly for a number of reasons - no time, overwhelming, feeling a need for all the toys etc, however decluttering is my number one tip regarding tackling toy clutter. Every six months or so, I do a declutter of the house (toys included), and whilst it can be time consuming, it is definitely well worth it in the long run. Toys accumulate so easily, even with just the one child, so regular decluttering sessions are so important. If you have children who are slightly older, get them involved in the decluttering - you may even be surprised by how ruthless they are with getting rid of things! Charity shops and toddler groups would happily accept your used, but in good condition, toys and of course there is also the option to sell toys on too. Make sure every toy, book, plush teddy, has a home. You may need to get inventive with the storage you currently have, or it may even mean investing in some new toy storage that works for all that you have, but a home for everything is vital to tackling toy clutter. I quite like toy storage that is functional, but that you can make look nice too, as well as being furniture that can grow with your child. A lot of our toy storage involves boxes and bins that can be easily accessed by little ones, but that also hide a lot of the toy clutter too. Also, if you do use storage that utilises bins, make sure the bins are organised, not a hodge podge of mess. If you have a play room in your house, then this tip doesn't apply to you, and you are one lucky buggar. If, like us, you live in a small space, overcrowding one room with toys will only lead to clutter, it's inevitable. What I do in our house is keep toys and books in both the living room, and Alexander's room, with craft activities being kept under the stairs. We keep a small collection books and toys Alexander plays with often in the living room, with the vast majority of toys being kept in his bedroom. It's totally okay for toys to come down from the bedroom, but they must go back up. We also rotate the toys within both rooms often, so all toys and books are being enjoyed and played with. Again, another quite obvious tip, but something that can be easily overlooked. Putting toys away as your child plays means your play area won't end up look like a tip, and instilling this into your child from a young age means the tidy up won't just be left to mum or dad. Toys as presents is a really lovely gesture, but often times a well meaning relative or friend won't be thinking about the storage you have in your house. There is nothing wrong with reminded loved ones about the minimal space you perhaps have, or suggest something other than a toy as a gift - I know my family are forever asking me what to get Alexander, and if I can saddle a few of them away from toys, then I will! Implement a one in, one out rule - we loosely use this rule to tackle toy clutter. The main way in which we put this tip to use is when it comes to duplicate toys. Now I don't mean the exact same toy (although that has happened once), I mean a toy that has all the same benefits as another toy. Just because your child asks for a toy, that doesn't mean they're going to have it. I know people in real life who will get there child anything they ask for - whether it was in a tantrum or on a Christmas list - they want, they get, and that is a terrible thing to instil in your child. It also means a whole lot of crap! Children really don't need a lot of toys, and I think that is important to remember, especially around times of giving. So there you have it, seven tips that have helped me tackle toy clutter, and all of which are things I will implement for quite some time to come, I'm sure! DO YOU HAVE ANY TIPS FOR TACKLING TOY CLUTTER? Most children have too much...our grandchildren certainly do! I honestly quite agree, Tom. Even though I declutter, I'm sure Alexander could very well have less than he does! Now is a good time to declutter - I especially with Christmas just round the corner really! A good storage system does help to keep things contained though. Haha - yes! We got them not long after Brighton actually. Alexander has a whole host of the trains now and spends a good amount of time recreating Thomas episodes and stories!